This third floor “King Deluxe” room overlooks the main entrance and pedestrian entrance to the U.S. Naval Academy. This room is located across the hall from Water Witch for those wanting two rooms. Maximum occupancy is two people in this room. Room-darkening shades, a mini-split providing both individually controlled heat and air conditioning, and a multi-speed ceiling fan add to your comfort. The room has a private bathroom and separate shower room en-suite, free Wi-Fi & HD cable TV. 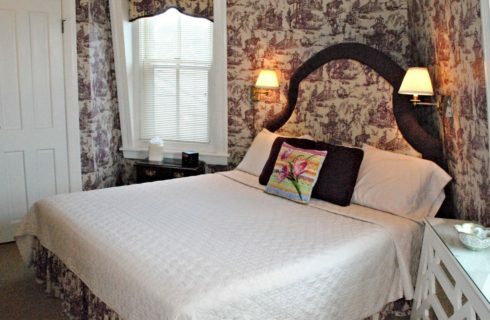 The room comes with free parking onsite for one car, a rarity in downtown Annapolis. The decoration includes reference to the United States’ naval presence in the Far East before the Second World War. A limited-edition print by Tom Freeman, “Far Yangtse Station,” pictures the USS Turtulia standing watch on the river at Chungking, China, in 1939, with the town rising behind it as a Chinese junk and smaller craft glide past. The print is beautifully mounted in a soft gold bamboo style frame and softly lighted at night by an overhead picture light. The room is richly papered in an aubergine eighteenth-century toile print in the period when Chinese design was all the rage. The border is an eighteenth-century Chinese Chippendale fretwork design faithfully copied in the radiator cover which has been hand-crafted. The room has an aubergine love seat and good seat-side lighting for reading. A tall antique Chinese chest contains a television. 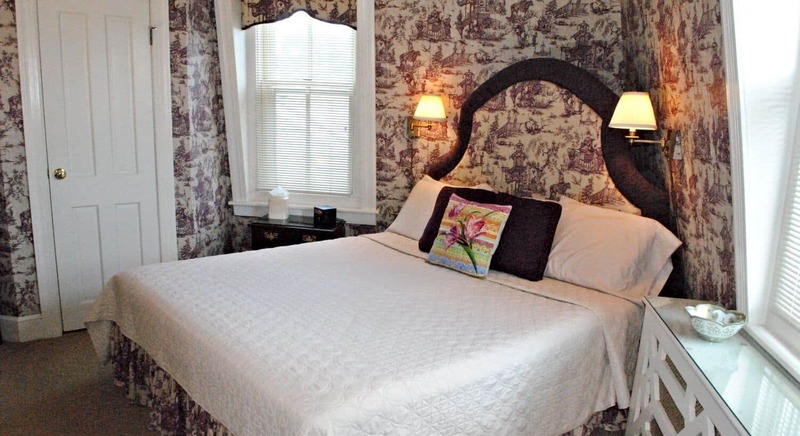 The custom-made king size bed’s headboard and dust ruffle duplicate the wallpaper print, as do the cornices in the dormer windows. The bed has bronze-finished swing arm lamps on either side for nighttime reading.